Marshall has a rich history with the Buncombe County Turnpike passing through, as the location of notorious Civil War events, and as the hub of Madison County commerce for many years. Old-time stores, dancing to Blue Grass music at the Depot, folks saying "hi" on the street and much more give Marshall a distinctive small-town, welcoming feel. And Marshall is maintaining that warm, small-town feeling while art galleries, high ceilinged apartments rich with brick and wood, restaurants with fresh menus, and unique stores begin to fill the century-old brick buildings. Spend an evening or an afternoon exploring Main Street and Blannerhassett Island. From Johnson City, TN: Follow 19/23/I-26 E towards Asheville. 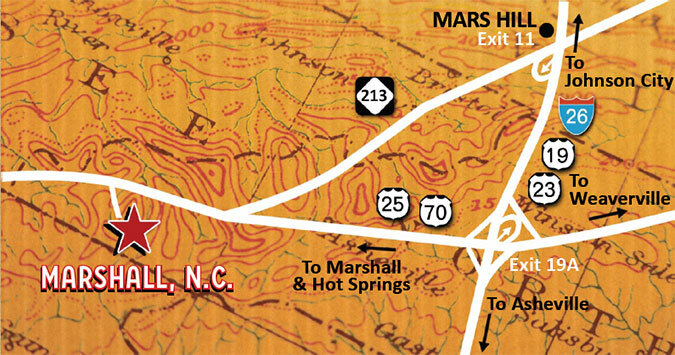 Take Mars Hill Exit 11, then left onto 213 West; continue for 8.3 miles, then slight right onto25/70 West; 1.4 miles, then left onto Walnut Creek Drive; 0.8 mile to downtown Marshall.